There is a slim-down Avocado and I have purchased it! Actually they had this thing going at Tops where you buy 10 items for $1 each, and you get an 11th free. And a lot of these items were kind of good deals in the produce section. So my Slimcado was free if you want to look at it that way. I wanted to get something zany as my freebie and so I chose that. It is worth it for the adventure! Amid my last couple days' stringent Pennario book editing I have wedged in some Slimcado research. 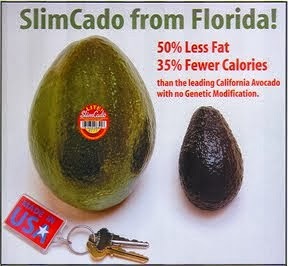 It is an avocado that comes from Florida as opposed to California. Response to it is mixed. I liked this guy's assessment of the Slimcado as being half avocado and half dinosaur egg.